Confor was heavily involved in a detailed feature on tree planting which ran on both Radio 4's Today programme and the BBC website. Chris Morris, an experienced BBC journalist, really got under the skin of the subject and analysed the figures in detail in an effort to understand why the Government is behind its 11 million trees by 2020 target - and why that matters. His online story here used tables very effectively and his 5-minute radio broadcast included an interview with Confor CEO Stuart Goodall as well as Justin Mumford, MD of Confor member Lockhart Garratt. Mr Goodall noted that the Government was "failing miserably" to hit targets, and explained that this mattered for a number of reasons - including a lack of timber to support future jobs and investment and to help the UK Government meet its climate change targets. Confor was involved from the start of planning for the programme, as part of its continuing efforts to ensure forestry issues are understood, and covered effectively, by the mainstream UK media. The latest coverage comes after a one-hour Countryfile special on forests - featuring Confor and its members extensively - was broadcast in the spring. "Confor has had an excellent year in terms of delivering coverage in the UK media - both on the BBC and in a number of national newspapers," said Mr Goodall. "However, the coverage is never an end in itself - we always link it back to how we can raise understanding of forestry and timber issues at the highest levels of Government, to help deliver the outcomes our industry, and our rural economy and environment, need." The coverage on Radio 4 came just a day after Theresa May reiterated the importance of meeting the tree planting target - when answering a question by the Vice-Chair of the All-Party Parliamentary Group on Forestry, Anne-Marie Trevelyan MP. Confor has also arranged filming at a planting site for a BBC Scotland feature which will run on Friday 10th November, ahead of the UN Climate Conference in Bonn - to illustrate the contribution forestry and wood can make to climate change mitigation. Tom Heap concluded that "Woodlands are to be used, not just admired" at the end of a half-hour programme on Future Forests. Confor's CEO Stuart Goodall was interviewed in detail for the programme, accompanying Tom Heap and producer Sarah Swadling to the UK's largest modern planting site at Jerah in central Scotland and to Windymains sawmill in East Lothian. The Radio 4 team was receptive to the message that modern, mixed forestry is very different to 20th century plantations and can deliver a wide variety of benefits. Forestry keeps featuring in the mainstream media and once more, Confor was the go-to place for the journalist to confirm planting figures, and get solid background information for their article. The Telegraph publishes a feature article on Forestry Commission figures showing that just 582 hectares of trees were planted in 2016 - the lowest number since records began in 1976. By contrast almost 2,700 hectares were planted in 2013/14. Confor has continued its efforts to take the forestry and timber message to a wider audience with an appearance on Radio 4's Farming Today programme. Stuart Goodall was interviewed about a new initiative to press the next UK government to provide grant to farmers to plant trees after Brexit. The campaign, led by think-tank Bright Blue, also has the support of The Woodland Trust, National Trust and WWF. That was the verdict of Confor’s Chief Executive Stuart Goodall, who featured prominently in the BBC's flagship rural affairs programme on 02 May. 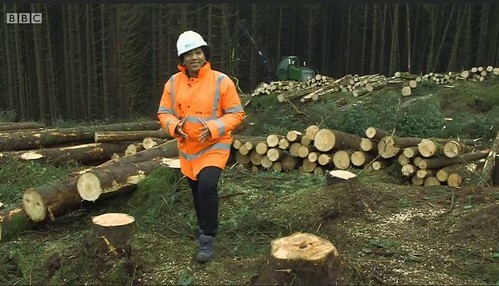 Confor worked for more than a year to persuade Countryfile that forestry and wood-processing deserved a higher profile on the programme - and when the decision was taken to run the forestry special, Confor worked closely with the Countryfile team to set up several main features. "England may be in deforestation state..."
The prestigious newspaper The Guardian has picked up on the issue of forest loss in England, providing a priceless media platform for both Confor and the Woodland Trust to highlight concerns over the lack of tree planting in England. The Guardian quoted Stuart Goodall and Austin Brady who warn that deforestation is not only a challenge in the developing world. England may have tipped into deforestation, with more trees being cut down than planted for the first time in possibly 40 years. Confor worked with BBC Scotland's Landward in October 2016 to highlight the scale of rural employment provided by the forestry and timber industry and to discuss the modern face of the sector with presenter Euan McIlwraith. Thanks to Glen Tanar Estate and James Jones & Sons for their support. Confor not only featured in a news report on commercial forestry, transmitted on the One Show on 29 October 2015. We were approached by the producers and were key in organising the production in record time. Thanks to Tilhill and James Jones and Sons sawmill for their collaboration.